Six Nations Trophy Tour and Much More! This weekend is shaping up to be a big weekend for Balbriggan RFC. On Friday, our youth girls are taking part in a training camp at the club, run by rugby legend Sophie Spence. Saturday sees Balbriggan RFC’s U12’s travel to the RDS where they will play a half-time exhibition match during the Leinster v Zebre match. This will be a great occasion for the U12’s and their families and almost 200 Balbriggan supporters will be in the stands to cheer them on. Then it’s back to Balbriggan for the Six Nations Trophy Tour! The trophies will be on display at the Bracken Court Hotel from 7.30pm and all are welcome to come along to see the trophies. Then to finish off the weekend, Balbriggan’s Women’s team are in the Leinster League final against Navan. This takes place at Naas RFC. KO 12pm. 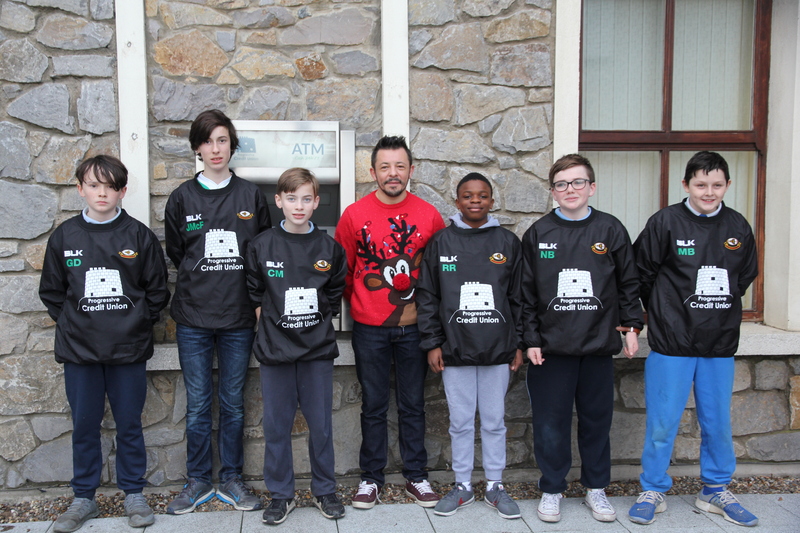 Best of luck to our U12s and to the Women’s team this weekend. Balbriggan’s IXV play at home this evening against Navan’s J1 team in the Provincial Towns Plate. KO is 8pm. This Sunday March 11th, Balbriggan’s Women’s team play Wanderers at home in the semi-final of the League. KO is 10.30am. The IXV are also at home in a crucial match against Midland Warriors. KO is 3pm. Balbriggan defeated Midland Warriors in the first round of the Provinical Towns Plate, in a match played in very cold conditions at home on Sunday. Final score 22 v 8. Balbriggan will face Navan’s IIXV in the next round. That match will take place at Navan RFC on Sunday March 18th. KO 3pm. Balbriggan RFC are greatly honoured to receive the inaugural IRFU ‘Spirit of Rugby’ Award. Club President Eamon Darcy and Club Welfare Officer Lisa Kelly, were presented with this award on Saturday afternoon, at a pre-match reception hosted by the IRFU at the Aviva before the Ireland v Italy Six Nations match. UPDATE – The Women’s game has been called off as Wexford’s 2nd pitch is unplayable. The IXVs match is still going ahead. Balbriggan IXV are in the Provincial Towns Cup for the first time in many years. The first round kicks off this weekend. Balbriggan were drawn to play Wexford away. The match takes place this Sunday, January 21s,t in Wexford. KO 2.30pm. All travelling support welcome. Before the Towns Cup match, the Balbriggan Women’s team will play the Wexford Vixens, also in Wexford. KO 1pm. I would like to take this opportunity to wish all club members and their families and all friends of Balbriggan RFC, a very Happy Christmas and a prosperous New Year. 2017 has been an exciting year for our great club. As you know, we are at the final stage before going to tender on our club house build, 2018 will see us providing the club with its first permanent home since the Club was first established in 1925. This is a marvellous time to be part of developing the future home of rugby at Balbriggan RFC. 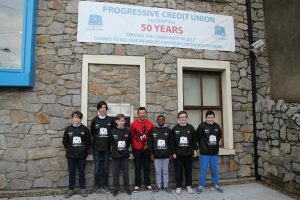 Here are some Balbriggan RFC players sporting the new U13 training tops, with Brian Howard of Progressive Credit Union. 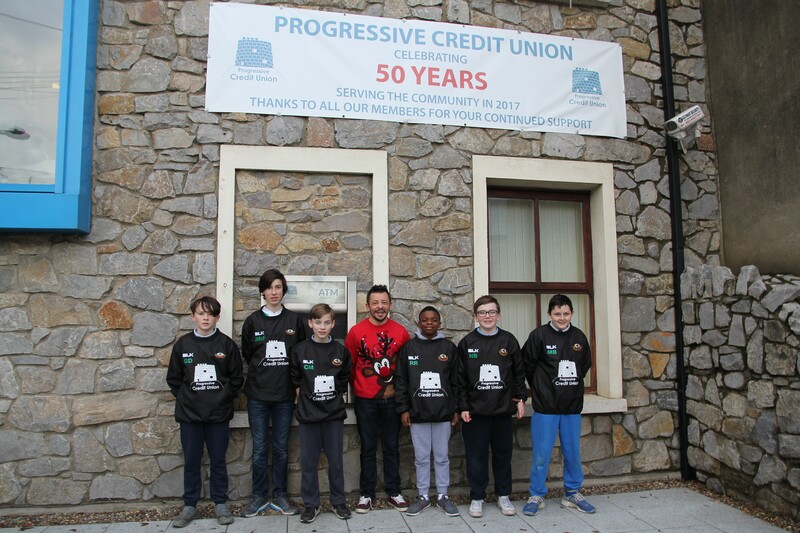 Thanks to Progressive Credit Union (PCU) for their continued support of the club. In 2017, PCU celebrated 50 years of serving the community. Congratulations to them on a great achievement.